Autonomous-driving is creating a paradigm shift in the automotive industry with a very stringent set of requirements, from the high-resolution cameras to the need for redundant and secure networks, running on reliable and low-cost cabling. As a result, the industry has identified Multi-Gig Ethernet over copper as the most promising technology to deliver connectivity for in-vehicles networks. Raymond James estimates that the silicon content related to autonomous-driving will represent a TAM of $30 billion by 20301. Each of these vehicles can have up to fifty units of networking silicon. Learn more about Multi-Gig AQcelerate products here. Aquantia is a leader in the design, development and marketing of advanced, high-speed communications ICs for Ethernet connectivity in the Data Center, Enterprise Infrastructure and Access markets. 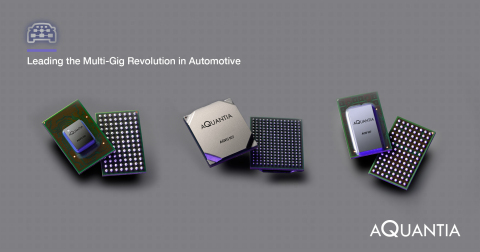 Aquantia products are designed to cost-effectively deliver leading-edge data speeds for use in the latest generation of communications infrastructure to alleviate network bandwidth bottlenecks caused by the growth of global IP traffic and in emerging and demanding applications such as autonomous driving. Aquantia is headquartered in Silicon Valley. For more information, visit www.aquantia.com.